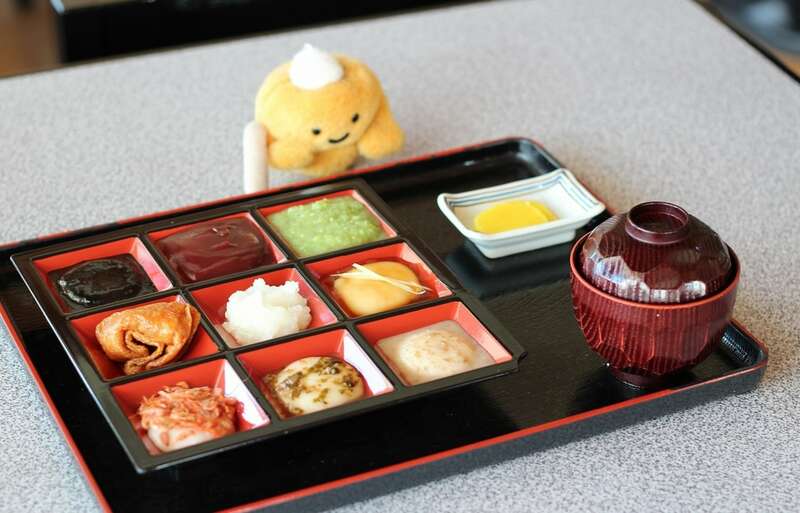 Follow us on an exciting tour of Iwate Prefecture’s Hiraizumi World Heritage Sites and, while we were there, we took the chance to snack on delicious Ichinoseki mochi! One day in 2011, Iwate Prefecture was bursting with joy as many temples, gardens and archaeological sites of Hiraizumi, representing the Buddhist Pure Land, were selected as World Heritage Cultural Properties. It was the second designation of its kind in Japan’s Tohoku region, following the Shirakami Sanchi selection as a Natural Heritage Site. The World Heritage Site designation is not limited to a confined location but consists of gardens, buildings and archaeological sites dotted around Hiraizumi. I wanted to know what kind of distance one would have to travel to see all of the Hiraizumi World Heritage spots and what the archeological sites were like. That summer day, I set out on a journey to the Hiraizumi World Heritage area. The scene that came into view as soon as I got off at the station was one of a very clean and well-maintained town. At the rear of the station to the right, I spotted a tourist information center and rental bicycles. All of the gorgeous buildings and gardens are close enough together that you can tour them by bike. But I wondered if I could fully appreciate the experience just seeing the sites without knowing any of the history behind them. So I went in to check out the tourist information center. Because Hiraizumi’s archeological sites are not all in one location, I found the seven-language guide that you can rent for ¥500 a day to be an extremely helpful system. For just a single coin, you get a traveling companion that will act as your “guide,” explaining the greatness of the World Heritage locations. What was great about it was that you get a touch pen that you use to select a language, and then whenever you use it to touch a photo in the booklet, it explains the location and its significance to you in the language you selected. Alright! Time to tour some World Heritage sites with the help of my trusty guide! My first stop on the tour was a temple called Motsu-ji. The temple is less than a 10-minute walk from the station, but along the way, there is a big, beautiful green space that seemed to have a healing effect as I strolled through it. Motsu-ji is home to a garden that is said to be representative of a Japan that embodied the world of the Pure Land. Originally, this was a magnificent temple complex with some 40 temple buildings and 500 monks’ quarters. The site was truly splendid during the Heian Period (794-1185), as it was the headquarters of Oshu Fujiwara, a noble family that wielded great influence in the Tohoku region. Following the downfall of the Fujiwara clan, many of the buildings were lost to repeated natural disasters. The Pure Land Garden and the remains of Heian-era temple buildings are still preserved in roughly the same condition as they were at that time. I recall a spot along the road to the temple from the station where it indicated the height of the flood caused by Typhoon Ione. At this temple that has withstood a great number of natural disasters, I encountered a monk by the name of Shirayama. At the ruins of a building destroyed by fire, only the stone foundation remains, clearly marking where it once stood. Ruins sleep beneath the beautifully manicured lawn. Though they are registered as a World Heritage Site, these archeological sites are obscured by grass to preserve them. The most famous sight at Motsu-ji is definitely its garden. The creator of this garden is not known for certain, but at the time when it was constructed long ago, the stones that line it were witnessed being carried in from the sea. The Heian Period overlapped with the unified Silla Period in Korea, an age when roads, distribution, and transportation methods were undeveloped. It is a wonder that such large stones were carried such a great distance to build this exquisite garden. A heavy rain the previous day made the garden appear even more beautiful, like a classic painting on a scroll. In the middle of the pond is a small island… and the ruins of a bridge, believed to have been destroyed by fire, remains. You can still recognize how the south gate, island, and main building were connected by the bridge. This garden was built in the Pure Land style, rather than the shinden-zukuri style common of Heian-era noble residences. Shirayama told me that presently, the water level in the garden at Motsu-ji is regulated to adjust the ambiance and preserve its beauty. The beautiful temple pond is encircled by an avenue of cedars, full of trees that are easily several hundred years old, so splendid that no one can resist taking a picture. I can only imagine how much more majestic the scene would be when the leaves change colors in the fall. After taking in the gorgeous pond, I moved on to another Hiraizumi World Heritage location about 2-3 kilometers (1.24-1.84 miles) from Motsu-ji, a temple called Chuson-ji. Chuson-ji is home to Heian Era art, over 3,000 national treasures, and an Important Cultural Property. The temple was started in the year 850 by the high priest Ennin. Later, in the early 12th century, Fujiwara no Kiyohara, founder of the Fujiwara clan, directed large-scale construction of temple buildings. 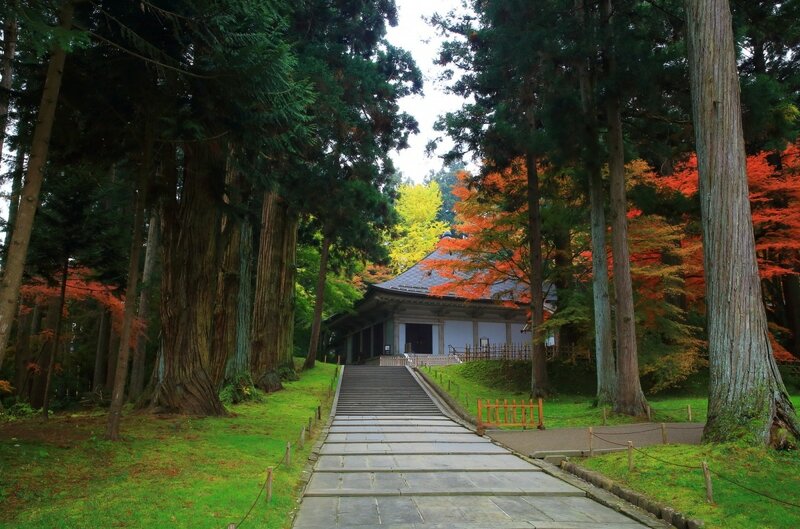 Those temples were built to bring comfort to all the souls sacrificed in the frequent wars in the Tohoku region, and to build an ideal peaceful society based on the teachings of Buddha. The Hiraizumi World Heritage area was larger than I expected from having seen it on TV. I walked up a steep road that went close to the main temple. The climb up the hill took about 10 minutes. At the top of the hill stands the famous Konjikido, which was built in 1124 and remains as a reminder of what Chuson-ji looked like when it was established. It is an entirely gold hall enshrining Amida Buddha, its interior and exterior both covered with gold leaf. It is likely that Konjikido is the first thing people think of when they hear Hiraizumi. I gazed at the entrance to Chuson-ji’s main building. It felt reminiscent of Korean history, and the architecture was also quite familiar. Tourists line up in front of the temple to take commemorative photos, so I stood in line, too, and was able to get a picture of Chuson-ji without anyone around.